The Queen was presented with a new brooch representing Saskatchewan during an audience with the province's Lieutenant Governor on October 17, 2013. 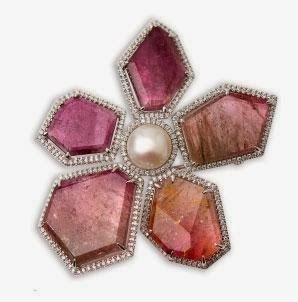 From Saskatchewan designer Rachel Mielke of Hillberg & Berk, it's described by the Lieutenant Governor's office as an 18K white gold brooch in the shape of a flower with five petals of Madagascar tourmaline in shades of pink with a central white fresh water cultured pearl, all surrounded by 300 diamonds (1.527 carats in all). The brooch is valued at $15,000 and was gifted by Hillberg & Berk. The designer shared with Maclean's that she spent a month studying the Queen's wardrobe to create something that would be a good fit, and that the tourmaline was already on hand, having been part of a larger purchase. After presenting the Queen with her new brooch, Lieutenant Governor Vaughn Solomon Schofield reported the monarch had gasped, smiled, and inspected her new jewel in detail. The remainder of the batch of Madagascar tourmaline that yielded the Queen's brooch has been turned into the Legacy Collection, available at the Hillberg & Berk website. I'm eager to see it worn, but so far I have to say it might be my favorite of the modern designs presented to the Queen in recent years - fresh, but not a radical departure from the traditional styles so often worn by the Queen, and done in a particularly lovely color. Update: The Queen wore this brooch for the first time publicly at church in February 2014.